It’s the day after Easter and maybe some of us aren’t feeling very resurrected. Maybe some of us are weary, sick, bended, grieving, breaking. Where is the resurrection power? Where is this new life, new dawn, new day? Someone turn the lights on and let some air in. The saints are suffocating and the sinners can’t find the door. I’m just a bag of bones. Away from home at a camp, I couldn’t get past the post-op pain of extracted, impacted wisdom teeth. Pain meds all gone and the nurse on the phone tells me what’s wrong. “You have dry bone pain.” I laugh, interrupting her. This isn’t about my teeth, I realized. But I let her finish because my laughing makes me sound unbalanced. This is obviously not a funny situation. There was a rattling in my spirit as the Spirit of God was shaking me back together in deep, dry, broken places. But. Can these dry bones live? I have learned not to ask God a question like that unless I want Him to answer. And like Ezekiel, but minus the wicked teleportation/vision to the valley, God showed me that the nurse was right. I had dry bone pain. Not in my teeth but in my heart, which was empty and dry right into the marrow of my actual bones. There were old wounds, past hurts, things that had caused pain once, but which didn’t have to anymore – still firing off and triggering pain anyway. My heart didn’t know any better. It is hard to let go of the past, phantom pain like a phantom limb, removed but still present. And it was time for God to show up and bind those old, open wounds so that they could heal. Only the Sovereign Lord knew. He told Ezekiel to prophesy to the breath and it came and those bones lived. He used a situation with my teeth to open my eyes to the work that had to happen in my heart. He brought my bones back to life, too. I will put my Spirit in you and you will live. Easter comes, the stone is rolled away, and Jesus is alive. 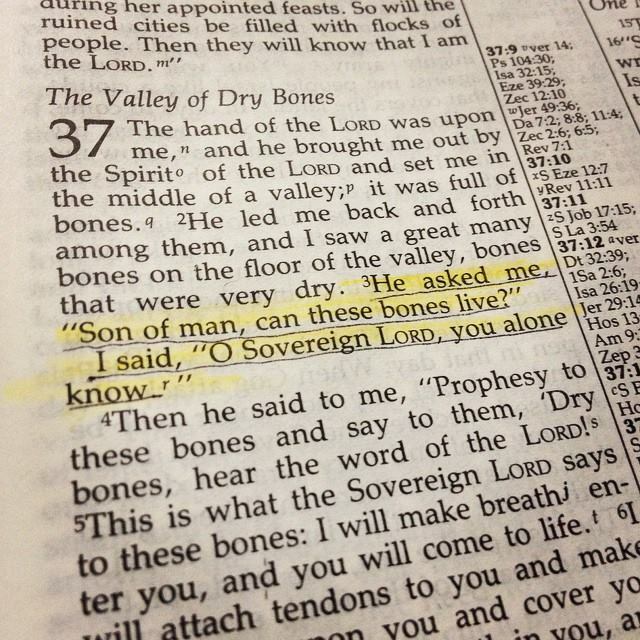 His Spirit in us and our dry bones live. Maybe it’s time for us to let Him come, bind up the wounds, and come alive again. Maybe.